Aadhaar is a 12 digit individual identification number issued by the Unique Identification Authority of India on behalf of the Government of India. Any individual, irrespective of age and gender, who is a resident in India and satisfies the verification process laid down by the UIDAI can enrol for Aadhaar. This number will serve as a proof of identity and address, anywhere in India. A 12 Number digit card with Picture of individual, including infants will be delivered when enrolled for Adhar. UIDAI will enable universal indian identity that any ID based application like ration card, passport can use and will collect demographic and biometric information from individual to establish uniqueness of individual. An instant account can be activated at any manned customer service point. Electronic Know your customer data is provided instantaneously by UIDAI. Instant Account Kit with card is handed over to customer, who can operate the account at any customer service point or through a mobile phone. 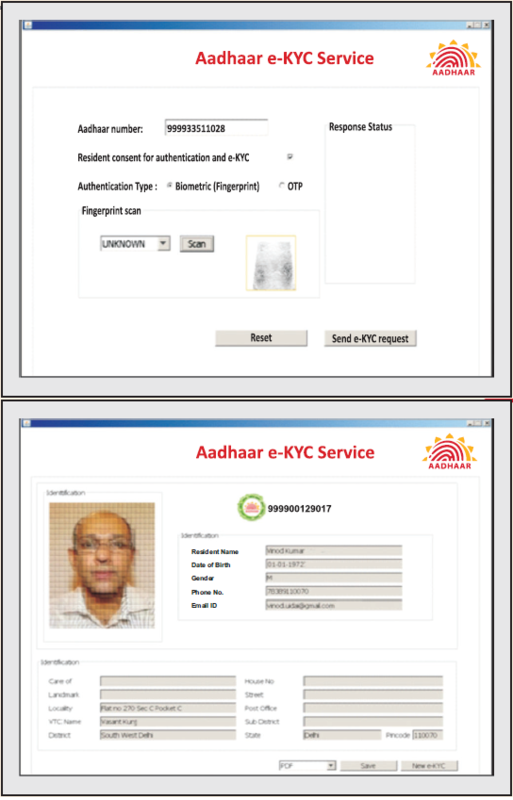 Aadhaar Iris Authentication is a process wherein Aadhaar number, along with the resident's Iris Image is submitted to UIDAI's Central Identities Data Repository (CIDR) for verification; the CIDR verifies whether the Iris data submitted matches the Iris data available in CIDR, which had been collected during enrolment, and responds with a yes/no reply. 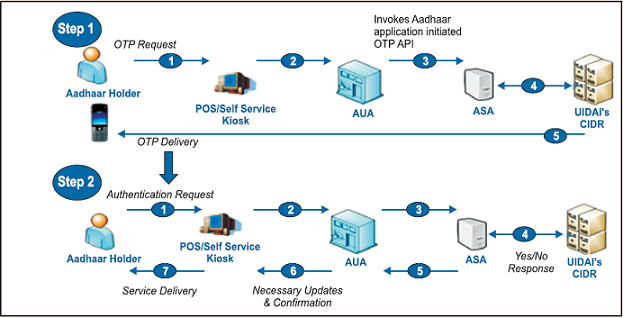 The OTP service enables Aadhaar based authentication of all residents who registered a mobile telephone at the time of enrolment or subsequent updation. With Aadhaar OTP, residents will be able to authenticate themselves using their mobile telephone anytime, anywhere on a self service mode without having to use biometric authentication device, which requires assisted service. 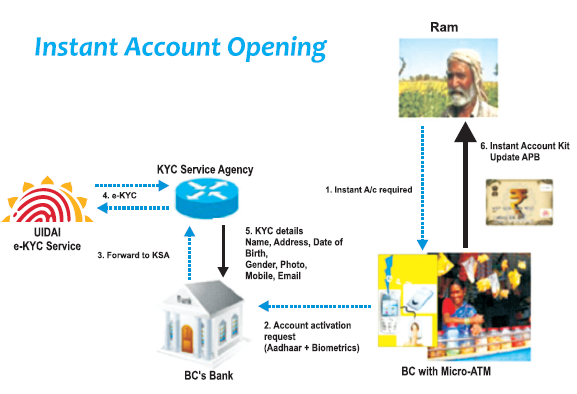 eKYC service can be deployed by different agencies to verify a resident's identity and address. Only DEMOGRAPHIC information (Name, Address, Date of Birth, Gender, Photograph & Mobile Number) that is collected during Aadhaar enrolment willbeshared, at the request of, and/or with the consent of the Aadhaar number holder. Along with the launchof these services, UIDAI also announced the setting up Permanent enrolment Centres. Permanent enrolment Centers also known as Aadhaar Kendras are required to facilitate the enrolment of residents left out during the camps organized by the Registrars in the past and new births. These centers would also provide other Aadhaar related services including Update of resident's biometric and demographic data. Aadhaar Kendras will be located in the Common Services Centres, government buildings in block/mandal/tehsil/ municipal ward office or in the official premises of the Registrar or such premises as may be expressly approved by the Registrars. Residents can also seek information about their Aadhaar generation status or get e-Aadhaar printed at these centres. Registrars may choose to charge a convenience fee not exceeding Rs.10 for printing e-Aadhaar letter and Rs.15 for update requests. If you have lost / misplaced your AADHAAR card OR if you have not yet received your AADHAAR card, To download an e-Aadhaar, log on to download an e-Aadhaar Enter details as shownonscreen : Remember to use the pincode given at the time of enrolment to open the downloaded document. Users can download e-Aadhaar through the access without limitation and restriction of OTP(OneTime Password). This new Toll Free Number 1800-300-1947 is being utilized by the UIDAI Call Center located at Pune and Jamshedpur. The Toll Free Number is in addition to the Short Code 1947 allotted to UIDAI by Department of Telecommunications. Residents can use both the numbers for their grievances/complaints relating to enrolments. Nice article. But please provide Aadhar card to all. 3 months back my village people were enrolled for aadhar card, but they are not getting. Please avail. Nice article, Very Helpful to us.